Looking good -- bar at collarbone level. But watch those feet! So, pretty important, right? Let's break down this exercise and how to do it right. When the RI says "mount the bar" (or "get the f**k up on the f'in bar"), mount the bar by jumping up and grabbing it with your palms towards you (palms away would be a pull-up). Hang completely slack so you are fully extended. 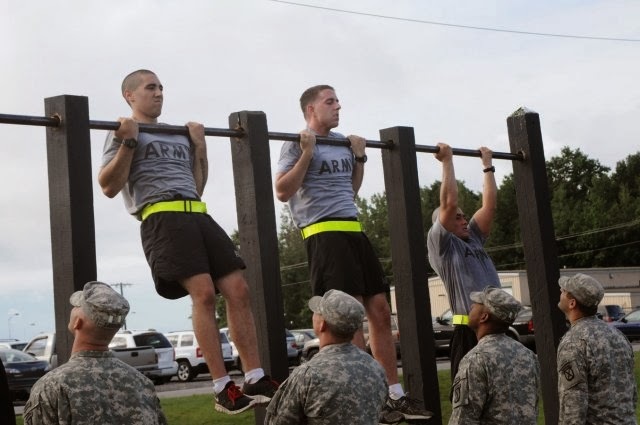 When the RI says "up," pull-up using just your arms -- no movement of your feet, knees, or abs. A good trick here is to tense your lower body slightly and point your toes downward. At the end of your pull, the bar should be right at the level of your collarbone -- not just below your chin. Get comfortable -- you'll be there for a second. When the RI says "down," lower down in a controlled way to a full dead hang. Again, slightly tensed body with toes pointed downward will keep you from swinging. Get comfortable again -- you're on the RI's schedule. At this point, the RI will either keep directing you or will just tell you to continue. Do not rush this -- straight up with just arms, brief pause with the bar at collarbone level, controlled downward to full dead hang, brief pause at bottom, then back again. After your sixth chin-up, go to a dead hang and wait. The RI will tell you "dismount" or "get the f**k of my g*ddamn bar, Ranger." Congratulations! You just passed the RPFT and you're officially in the class for RAP Week. The takeaway? Forget the guys in the gym doing 1,000 chin-ups. Forget the awesome kipping and butterfly pull-ups you're learning at the CrossFit box. And forget going fast to build your numbers. Get on the chin-up bar and work like you're doing the RPFT. Here is the basic bar I used -- hangs from any standard door and doesn't need any bolts or screws. Here is a super-fancy bar -- same price, but I've never used it. But guess what? You probably have a playground near you -- and that means there is probably playscape with a horizontal ladder ("monkey bars") or even a set of pull-up bars ready to go. Just don't be creepy -- go in the morning when kids aren't there.